By Michał Szczuryk vel Szczerba - PhD candidate. The serum-ascites albumin gradient (SAAG) is a medical value that represents the difference of albumin concentration between blood serum and the ascitic fluid. This discrepancy is used by physicians to differentiate the various mechanisms of abnormal fluid accumulation, especially portal hypertension. Read along to learn how to correctly calculate the serum-ascites albumin gradient, what does it mean, and how it relates to the source of ascites. If you find this article helpful, you may also like our total body water calculator. Ascites is defined as a buildup of more than 25 mL of fluid, located in the peritoneal cavity. It can arise in various mechanisms, with different underlying causes. Characteristics of the ascitic fluid can be used to link the diagnosis of ascites with its true etiology. Two main parameters are key in the assessment of the peritoneal fluid: serum-ascites albumin gradient (SAAG) and ascitic fluid total protein (AFTP). The former - the main focus of this article - is considered more useful in identification of portal hypertension; whereas the latter remains important in the differential diagnosis of ascites. The AFTP measurement is used to classify the ascitic fluid as transudate (arises as serum filtrate, due to elevated hydrostatic pressure or lowered oncotic pressure of the blood) or exudate (leaks from the serum through the inflamed blood vessel walls). However, this distinction is less conclusive in diagnosis of portal hypertension. Transudate ascites can concentrate blood by removing water from the serum. Using our free water deficit calculator you can calculate how much water is needed to counteract this process. Because the fluids in the human body are in dynamic equilibrium, it is critical for both albumin measurements to be carried out at one time. Importantly, varying albumin levels during ascites affect the calculation of calcium level. This inaccuracy can, however, be corrected for with the help of our corrected calcium calculator. SAAG > 1.1 g/dL (>11 g/L) is a reliable (97% accuracy) diagnostic of portal hypertension (or a non-peritoneal condition) as the cause of ascites. However, the value of ascites albumin gradient alone does not provide any clues to the cause of this hypertension (e.g. liver cirrhosis). This range corresponds to the ascitic fluid being a transudate. SAAG < 1.1 g/dL (<11 g/L) indicates ascites of non-portal nature, or a peritoneal origin (for example peritonitis). This range corresponds to an exudate nature of the ascitic fluid. Michał Szczuryk vel Szczerba - PhD candidate. 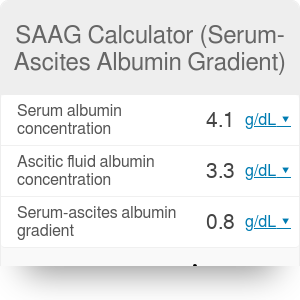 Serum-Ascites Albumin Gradient Calculator can be embedded on your website to enrich the content you wrote and make it easier for your visitors to understand your message.